Cnet has a very interesting story about being able to reboot a computer, extract the memory and then find the encryption key for apples file vault. I added an amplifier to my house antenna, which means I now get all the Baltimore digital channels, but one of the things that has been frustrating me is why I don’t get the same programs on the WETA-HD as I do on on WETA’s analogue channel. I now have a better idea after reading this article. Which explain that the master PBS feed has a lot to do with it. Personally I would love it if WETA would flip there HD main channel or even a sub channel to match their analogue, that way I don’t have to suffer a crappy analogue channel. One of the reasons I put in the amplifier was to get MPT which matches its analogue channel to its HD channel by upscaling the signal to HD. Oh well, even if it is not HD the quality of upscaled is better than analogue so it is the lesser of the evils. 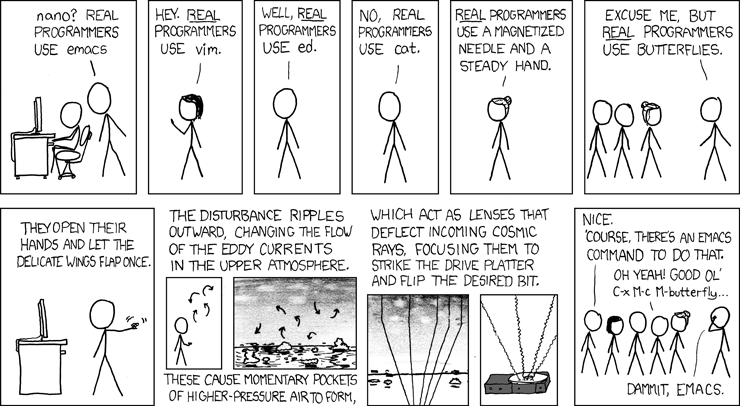 I only recently started reading xkcd, I discovered last week that the cartoons have an alt tag that continues the story or adds more context to it. I heard on the radio this morning that two servers were found by the trash and was kind of shocked. My first reaction is how can anyone miss to servers, if they contain current information then they are probably in use so someone would notice them going offline. Then I read the Washington Post Article. According to the DC Tax office the machines haven’t been used for 5 years, which makes me feel a little better, but it will be interesting to see what is currently on the servers, my guess is that they were sold off as surplus and have been used somewhere else for the last 5 years until the current owners decided they weren’t worth the power to keep them running and junked them. What I am really hoping is that the machines were truly wiped before being retired by the DC tax office. I know that very few companies have a good asset retirement policies. I wasn’t really watching the superbowl, but i saw this ad and did wonder how they did it. Kind of amazing the lengths they will go to make a 30 second spot. Oh, and no this didn’t make me want to go out and buy one. I have been looking for a good way to share my GPS data from our last skiing trip. It turns out that Garmin has a website called motionbased.com that goes a good job. I had to gzip the Garmin Trainer export file before it would upload. I tried a couple things with the GPS, on Saturday I would hit start at the top then stop at the bottom, on Sunday and Monday I would just hit lap at the top and the bottom. Hit lap means that you see the lifts as well as the skiing, interesting for checking with chairlifts are the fastest. I thinking about trying to get tickets for the U2 3D movie at the Smithsonian on saturday. Call me if you are interested. I have grown to tolerate vi since it became a pain to install my favorite editor jove and ue stopped compiling on anything recent.